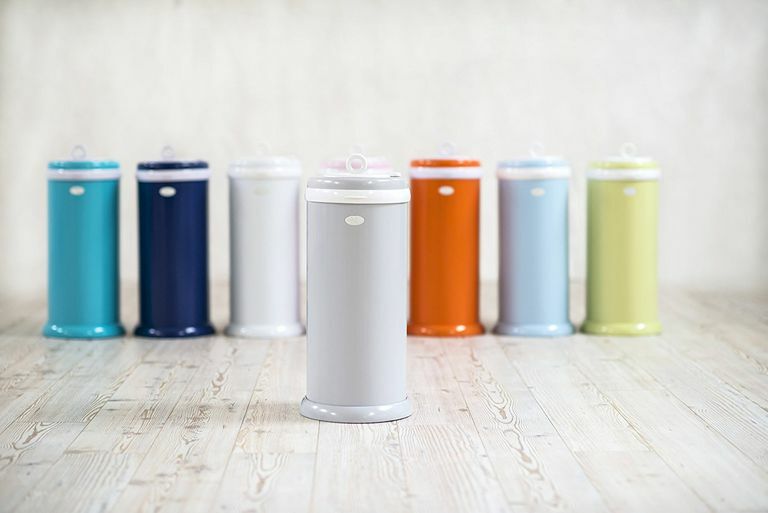 The Ubbi Diaper Pail is made of powder-coated steel and comes in loads of colors. You can use regular kitchen trash bags with this diaper pail, so you should save money versus diaper pails that require a special kind of bag. The lid has rubber seals and a sliding top for adding diapers. There's also a lock so that curious little ones can't get into the diaper pail. The Ubbi pail is 23 inches high and is an oval shape that measures 11 inches by 15 inches. The Ubbi is one of the best-looking diaper pails ever made. It's sleek and modern, and you can choose from 18 different color and pattern options from bold to trendy and soothing. There are neutrals if you want something that blends with the rest of your home decor. Available solid colors are purple, red, aqua, orange, baby blue, navy blue, light pink, hot pink, lavender, mint green, white, gray, and ivory. Patterns are also available, such as gray and white chevron, navy with white stars, pink hearts, and black and white clouds or triangles. If you want to customize a solid color diaper pail, Ubbi also sells a set of decals in a range of themes so you can just peel and stick to make it yours. This diaper pail is very easy to use. You add a bag so it's snug around the top arm and close the lid. Then you slide open the door in the top to add a diaper. Once you've closed the sliding door, you can turn the little lock button to prevent your child from opening the lid. The Ubbi diaper pail can hold close to a week's worth of disposable diapers. During that time, when the lid is closed, no smells come out of the pail. It definitely keeps the olfactory grossness where it belongs. That's one big advantage of the powder-coated steel. It won't pick up any odors from the diapers as plastic diaper pails can. When it's time to change the bag, you just open the lid, tilt the arm of the diaper pail up and release the trash bag. Ubbi makes plastic bags (​see on Amazon) that you can use in the diaper pail, too. You don't have to use their brand, but the advantage to theirs is biodegradable plastic. You could also compost or recycle the bags. If you're using eco-disposables or a hybrid diaper system with disposable liners, the biodegradable trash bags might be a good option for you. The company has also considered cloth diapering families. Ubbi makes a washable cloth diaper pail liner (​see on Amazon) so that you can throw the whole bag full of diapers into the washer. The Ubbi pail holds about 3 days worth of one-size pocket diapers for an older baby. For a newborn, you'd probably be able to fit two days worth of cloth diapers in there. Since you'll probably want to wash the cloth diapers at least every two or three days, anyway, that's a perfectly acceptable size for a cloth diaper pail. When it's time to change the bag, you get a lot of gross smell at once. That's the one advantage of paying for those special bags on other diaper pails that twist shut after each diaper is added so the smell is sort of sealed off. However, with any diaper pail, you're going to have to deal with a smell now and again. It's part of life with baby. If you let the bag get too full, the little tabs inside the diaper pail can catch on the plastic and rip the bag. Overstuffing can also tear the bag when it hits the arm that holds the top of the bag. The cloth diaper bag is supposed to be waterproof, but the outside can feel damp when emptying the diapers into the washer. Nothing leaks out of it, but you may not enjoy feeling any wetness on the outside of the bag. The top of the bag near the drawstring is made of a stretchier, almost sheer material. If it comes into contact with a soggy diaper, that part of the bag definitely takes up moisture. That's pretty gross when it's time to change the bag. Again, not filling the diaper pail to the top helps. At about $80, this is one of the more expensive diaper pails on the market. It is worth the price as far as keeping smells contained and being super easy to clean. In fact, it rarely requires much cleaning. It's really nice that you can use the Ubbi pail for disposable or cloth diapers, and it will look good in any nursery. If you're willing to practice a little on filling it to the right spot and removing the bag carefully so you don't tear it, you will probably be very happy with this diaper pail.